This article submitted by Linda Stelling on 9/8/99. Awesome, fantastic, extremely rewarding, and challenging were words a group of local residents used to describe their trek to the bottom of the Grand Canyon. Hiking the Grand Canyon in April were Linda Liestman, Mike and Kim McKigney, Paynesville, and Tammy and Kevin Sommerfeld, Manannah. Liestman organized the trip for the group, securing the required permits, information about the Grand Canyon, supplies, and itinerary. The group spent five days in the Grand Canyon. The hikers at the end of their hike. Pictured from left to right: Kevin Sommerfeld, Tammy Sommerfeld, Kim McKigney, Linda Liestman, and Mike McKigney. Linda and Mike started conditioning for the trip six months in advance. Kim conditioned for the trip for four months. "We knew we had to condition ourselves as it was a brand new experience for all of us. We tried climbing hills and walking trails at Sibley State Park," Liestman said. "If we do this again, we'll know we need to climb ladders, logs, and rocks, to work on a different set of muscles." "We tried researching about the Grand Canyon but found nothing really prepared us for what we encountered," they said. "Tom Koshiol and Dr. Tom Sult were helpful with suggestions as they both had been to the Grand Canyon many times." Kim said by the end of the first day of their hike into the Grand Canyon, their muscles were killing them. "We had to force our minds to work through how miserable we were. Every muscle ached," Kim added. The group had walked 7.7 miles in about 11 hours. "We felt good about our trek after hearing reports from others who had taken longer or never made it that far," Linda said. Linda and Kim explained that in their first day they dropped almost 5,000 feet in elevation from the start of their trek to where they stopped for the night. "There is such a change in climate as you hike down the canyon," Linda said. In areas they found pine trees, oak trees, and then cactus life. The Grand Canyon has many different trails a vacationer can opt to hike. The Paynesville group hiked the "Hermit Trail," the second hardest trail. However, on their hike out of the canyon, they hiked "Bright Angel," the easiest route. "We negotiated a lot of rock slides. It took us the first four hours of our hike to get used to the terrain. Walking on the rocks was like walking on ball bearings," Linda said. "What I remember most about the first day was that all of sudden I was sitting instead of standing," Kim said. Besides hiking rough terrain, the group was also carrying all the supplies for the duration of their hike. The backpacks ranged in weight from 32 to 52 pounds. Each person carried one day's supply of food and supplies. The group was warned that they needed to be eating all the time to keep the electrolytes up in their system. "A person isn't always hungry and you don't feel like eating following a long hike. We learned our lesson the hard way as a few of us were feeling the affects of the hike and change in altitude," Linda said. Each hiker carried a 90-ounce water bladder to drink from. 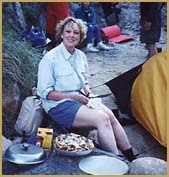 Here, Linda Liestman made the hikers a deep dish pizza for supper on the first night. Linda and Kim said squirrels were their biggest problem on the trek. Squirrels and mice would come into their campsites and chew holes in their packs to get at their food. One night they had made fresh baked bread but did not know where to hide it from the animals. They placed it by Mike's head as he snored so loudly nothing would come near him. However, mice got into a backpack 20 feet away. At a few campsites, ammo boxes were placed there for campers to place their food in at night for safe keeping. Linda said hikers in the Grand Canyon were made aware that what you take into the canyon, you bring out. There were no garbage cans at the campsites. Hikers were required to take their garbage out of the canyon with them. "A person couldn't be afraid of heights and hike these trails," Linda said. She described the trails as eight inches wide with a 1,000 foot drop off at the edge. The two women said that by the fifth day of their trek, they felt they were in shape for anything. They had traveled a total of 32 miles. When they reached the head of the Bright Angel trail, they saw a sign "Why Suffer." The group had a good laugh over the sign. They said they should have read the sign before they left on their trip and not afterward. "As we neared the end of our trek, the people we met cheered us on, giving us encouragement that the end was near," Linda said. "Once we left the canyon, a person missed the remoteness of the canyon as you were back in civilization." "The scenery was incredible," the two women said. "The views were so haunting you have a hard time getting them out of your mind. The grandeur was unbelievable," Linda added. Kim said the hike was a spiritual quest for her as it showed her what she could accomplish. Linda, who just turned 50 recently, said the trip proved to her that she was still in condition and could still complete a difficult hike. Both women said they would go back in a minute. "The trip was over too fast," they added.